When you want to make a little extra money to pay down debt or save for your next vacation, it’s best to start with what you have right at home. Some of the best selling items you can find are hiding right under your nose. Most people don’t realize just how much cash they have laying around their houses. A few garage sales or even listing a new item for sale every day in the Facebook Marketplace can net you over $1,000 over the course of a few months. In fact, if you have an eye for deals and are good at spotting them, you can make good money selling new items online through Amazon FBA. The Selling Family does this as a business and has some great training and resources that can help make money selling things online through Amazon too. Of course, not everyone wants your old clothes or dishes, but they might want some of the best selling items listed below. All you need to do is send your phone to them and they can give you a quote. Once they buy it, they refurbish it and resell it. Apple also buys used devices. I actually just bought a refurbished iPhone from them last week. Selling your old smartphone is a great way to make money from items you already have in your home. Electronics traditionally bring in the biggest bucks, especially if they are in decent working condition. So, dust off your iPods, phones, laptops and cameras. You might be well on your way to making some serious cash! I just bought my son his first bike off of Craigslist for $40. It was in excellent condition and the price was way better than buying a new one at the store. Children’s bikes can sell for hundreds of dollars at specialty bike shops, so I was grateful to this family for keeping the bike in such nice condition. In fact, buying gently used kids toys in general over new ones is a great way to save money on kids toys and slash expenses in your home. Obviously, the best selling items will be items that are newer with minimal scuffs and rust. I’ve even seen families selling their outdoor swing sets for low prices as long as someone comes to take it down! Nothing surprises me these days! I recently learned that many women buy used perfume on eBay as a means to save money. This shouldn’t be too much of a shock, since a friend of mine regularly buys her shampoo on eBay, even sometimes buying used bottles. However, I’ve never considered selling my own. I have a bottle of Chanel perfume that’s still about 60 percent of the way full. A quick eBay search of recently sold items that are similar showed me that some people paid anywhere from $30-$50 for used bottles of perfume just like the one I have right here. That’s some serious grocery money! So, although new items are always going to retain more value, don’t think that perfume, shampoo, etc. that’s only half full is worthless. Quite the contrary; you could get some good cash for it! It’s common for students to sell their used textbooks, but you can sell many different kinds of books in your home. Every now and then I put the ISBN number of books I have into a website (like BookScouter) because they will give you several different offers from several different book re-sellers. Be mindful of the quality of your book when you are pricing it for sale and avoid overpricing. I once had a seller agree to buy a book from me for $30 but then they sent it back, saying some of the pages were bent. Over the past few days I’ve been talking to my husband about possibly selling some of our larger kitchen items, like our KitchenAid Mixer, but my husband loves using it when he gets the chance to cook. Like many couples, we also have other gadgets that we got for our wedding like a bread machine, bar accessories and more. Selling items like this that you don’t use not only gives you extra cash, but it’s a great way to declutter your house. We literally use one regular pan and one cast iron skillet for almost all of our meals. So, I’m thinking a nice, big kitchen purge could earn us about $100 or so if we put our minds to it. Ultimately, you don’t have to go far when it comes to making a few extra dollars. Instead, focus on your home and the belongings in it to find best selling items on hand that you could sell. Even $1 or $5 for various items can add up over time. Have you ever sold some of your gently used items? What are some other used, popular selling items you’ve seen do well online? What are some unique ways you’ve used to make extra money? 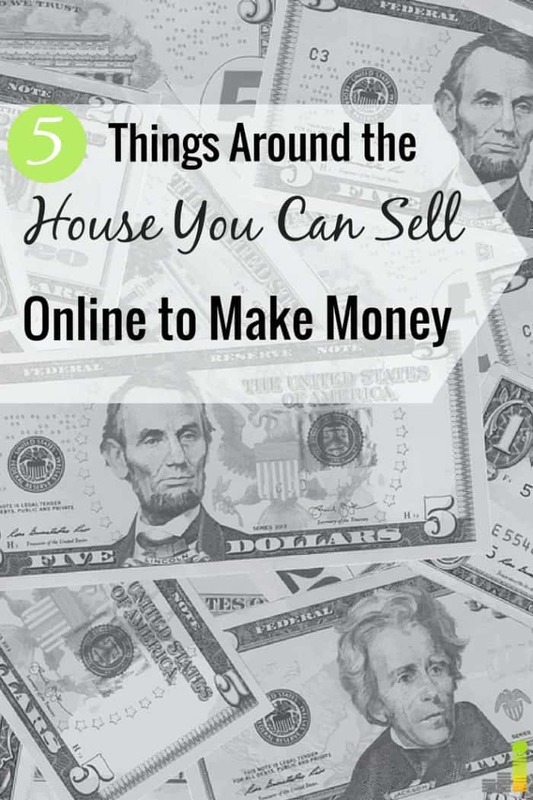 The post The 5 Best Selling Items Sitting Right Under Your Roof appeared first on Frugal Rules.